Posted on 4/5/2016, 9:02 am, by rackycoo, under General Projects. Bees play an important role in pollinating flowering plants. Without bees, the world as we know it would not exist. 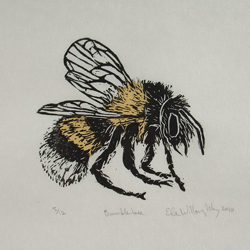 Here’s some great artwork that pays homage to our friends, the bees. minouette created this beautiful lino cut print by printing with black on both white and yellow paper and collaging the yellow details on the artwork. 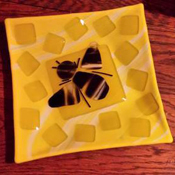 This fused glass dish by fancybutch is just the bee’s knees! 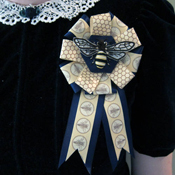 BananaAmbush declares her love for this important insect with a bee-themed ribbon rosette featuring a stumpwork bee in the center. 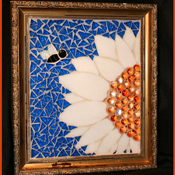 HSG made this bright glass mosaic featuring a busy bee and a happy flower. Thanks for the pollination! Are you the queen bee? audio made a colorful collaged ornament that just might be suitable for your highness. 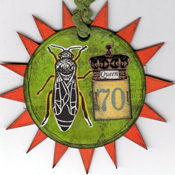 Buzz on over to the Craftster tag “bee” to see more bee-related projects. There you’ll find bee art, bee costumes, stuffed bees, bee costumes, and even posts relating to beekeeping. There’s something for everyone!